How to choose the right kitchen equipment for your restaurant is a huge question, and, just as important is how to choose the correct company to supply you with this equipment. Choosing kitchen equipment is much like choosing other kitchen supplies such as clean tea towels, uniforms for your staff. Often the answer can be found by providing the answers to the following questions. 1. What is your menu? 2. How will the food be prepared to meet this menu? 3. How many meals do you expect to do in a single session? 4. Do you have a kitchen layout design? 5. Do you know the workflow patterns for this layout? 6. Do you know the food flow patterns for the kitchen? If the company you have chosen to supply your kitchen equipment employs a chef in their sales team then so much the better. The good news here is that they will understand what you do and how you want to do it. So, bring your menu along and listen to what they suggest. Equipment choices are varied and equipment can be either gas or electric. Commercial cooking equipment categories include static or convection ovens, deep fryers, combi ovens, grill plates, char grills, wok burners, tandoors, microwaves and even sous vide. Depending on how busy you think you will be then determines what size equipment is best suited to your operation. For example a smaller establishment might have a 4 burner oven, while a busier venue would probably opt for a 6 or 8 burner oven. Grill plates come in 300mm, 600mm, 900mm and wider, as do char grills. Deep fryers can be single, double or even high performance. But it doesn’t stop there! Then you need to decide on your refrigeration needs. Do you have a space for a coolroom? Once the food has been prepared where will you store it? 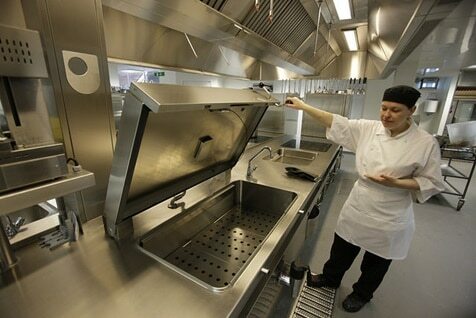 Under bench fridges with stainless steel worktops are often found in the cooking line. What about a freezer? You will also have to consider what benchtop equipment you will need. Choices here might be blenders, food processors, planetary mixers, stick blenders, and the list goes on. The simple rule for this is to not cross paths, both for staff and food, when planning your kitchen layout. Serious errors in kitchen layout can impact staff safety. In a recently designed kitchen, the food came out of the coolroom for preparation and from there it was stored in the preparation fridge. When ordered it went into the conveyor oven. It was at this point that things went wrong. There was nowhere for the pizza to be cut and plated and then the service window was back at the other side of the kitchen, before the preparation bench. Oops! A fast food joint owner was doing business in a busy CBD lunch area serving office workers. The requirement is, of course, the faster you can serve them with great food the more they like it, and the more likely that they would come back and also tell their friends! The owner was seeking a way to preheat the wrap bread before putting in the filling, to maximise the flavours within. Looking at her kitchen design there was no simple solution as her preferred method was to quickly heat the wrap on a flat grill. Unfortunately the grill was in a different location and the simple act of walking there to heat up the wrap would have caused unnecessary delays plus crossed paths with the busy staff working in that area. Putting a small grill in the wrap area wouldn’t work either due to the sheer number of wraps they would be making fresh. A commercial microwave provided the best and simplest solution, providing for both the speed and quantity requirements. New equipment has many benefits, you know it will work as designed and it has a new warranty which provides a much higher level of security for the owner. These days with new equipment you can also take advantage of bundle deals, where the more you buy from one manufacturer the better the price. Extra or extended warranty periods are also very popular to give you added peace of mind. Purchasing new equipment often takes the worry out when buying catering equipment. Check out restaurant and food service equipments in this catalog. On the flip side, new equipment is also the most expensive option in terms of initial cash outlay. There is a continuous stream of customers who would prefer used equipment as a way to SAVE money on their start-up costs. These days, a popular way to buy second hand equipment is through Silver Chef’s ex-rental equipment. They have an extensive range and it is a clever way to increase your cash flow even further with competitive prices on quality ex-rental equipment that is both professionally cleaned and serviced. All their ex rental equipment comes with 3 months warranty on parts and labour and much of the equipment is less than 12 months old. This equipment is warehoused in both Brisbane and Melbourne and there are great savings to be made through a small network of dealers that Silver Chef have chosen to work through. Often sold as “preloved” it can sometimes be an incredible bargain, especially when purchased for the right price at auction. Tip: before you purchase any equipment, make sure you have done your homework. Know exactly what the new price for the equipment is. Understand that the new price is not the retail price as given by the manufacturer, but the discounted rate that an authorised dealer is prepared to sell it for. Many people have been caught out buying used catering equipment, only to later realise that they paid almost new price without any of the benefits, such as the NEW warranty period. Equipment purchased at auction and through websites like ebay, often do not have a product warranty so be warned. If the eBay seller is based overseas then that equipment may not even have the necessary approvals required for use in Australia. There are both electrical and gas approvals required for all catering equipment that is sold in Australia. As an example, without the required gas approvals, plumbers are not supposed to connect an item to either natural or LGP gas lines. Also stainless steel kitchen equipment is timeless in appearance. It may look 2 or 3 years old but the reality is it could well be 10 or more years old. One potential way to find out the answer to the question ‘How old is this equipment?‘ is to search for the serial number. You could then ring the manufacturer or importer and ask them the question. I recall doing exactly that once on behalf of one of our customers who was looking at a 2nd hand dishwasher that the used dealer said was a ‘bargain’ and ‘only a couple of years old’. The Australian manufacturer informed me that the dishwasher was actually over 10 years old and that they had a full history of service calls that had been made. Not good! It turns out that this dishwasher wasn’t quite the deal that the used dealer had implied. I am guessing that the used dealer involved actually knew all of this, so it is definitely a case of buyer beware. The bottom line is: if it is that good why was it sold in the first place? And the answer to that question may save you a fortune!